Let's get your system to do something. 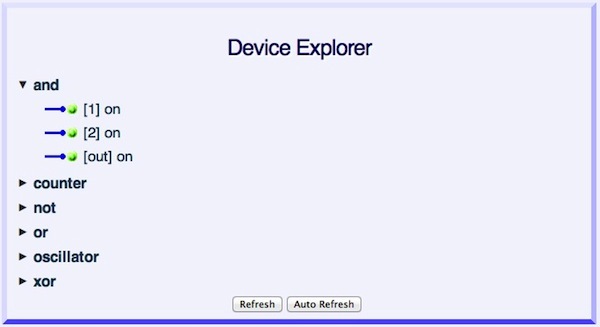 At the top of the Device Explorer page, click on "Scripts". You will now be on the Scripts page. At top of this page, click on the button labelled "View Filter". From the pick list, click on "examples". You will now be presented with a list of example Scripts or Recipes. There are a bunch of Recipes there, and we are interested in the ones that start with the name "Scripts/examples/virtual". The "virtual" examples Scripts are Recipes that use Virtual Devices, or purely software Devices. We can run these on any system without needing to attach additional physical devices. Click on the "Run" link of the Script called "Scripts/examples/virtual/combinational_logic.script". Wait for the Script to load and click on the "Home" link at the top of your screen. You are now running a group of Logic Devices. These implement the basic And, Not, Or, and Xor logic functions. To stimulate the logic, we wired a 2 bit binary counter to each Device's inputs. The counter changes every 5 seconds. Click on the And Device's expander and click on the "Refresh" button at the bottom of the page. As you click on the "Refresh" button, you can see the values on the And Device's inputs (terminals 1 & 2) change, and its output (the "out" terminal) change. As expected, the output is only "on" when both inputs are "on" (the And is on when both input 1 AND input 2 are on). To better understand this Recipe, try clicking on the other expanders. Visit the Wires page by clicking on "Wires" at the top of the page. Read the Recipe by "Show"ing it from the Scripts page.